Figure 1. 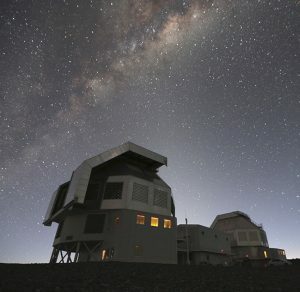 The Magellan telescopes, at Las Campanas observatory in Chile, where the photometric and spectroscopic followup data was taken. Credit: Ana Frebel. The next-furthest quasar, catchily named ULAS J1120+0641, was discovered way back in 2011, and is the only other quasar detected at a redshift greater than 7. Getting a larger sample of quasars at these high redshifts has been a high priority in research into the early universe, but they have proven hard to find. Why quasars? They’re the most luminous objects in the universe, and investigating what happens to the radiation they emit tells us about the universe around them. Why z > 7? Because then we are probing the epoch of reionization. Why is it so difficult to find these very distant quasars? The easiest way to spot quasars is using their optical spectra, and surveys like SDSS have uncovered thousands of them. But above z = 7, quasars stop being visible in the optical bands. Neutral hydrogen along the line of sight absorbs much of the radiation hotter than the Lyman-alpha line, the first electron transition of the Lyman series. At z > 7, the remaining emission cooler than Lyman-alpha is redshifted to observed wavelengths longer than 1 micron – well out of the optical window. 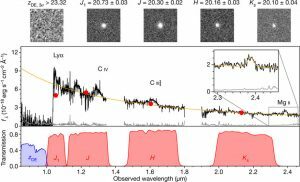 The approach used by the authors of this paper is to combine three infrared surveys probing three different wavelengths. 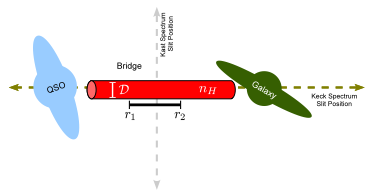 If a source is detected in the longer two wavelengths, but not in the shortest, then it is likely that all of the emission beyond 1 micron is absorbed by intervening neutral hydrogen, so the source must be at very high redshift. Follow up photometric and spectroscopic measurements, shown in figure 2, confirm that the source is a high redshift quasar! 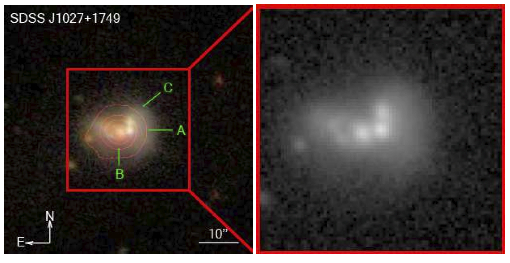 Figure 2: The photometric and spectroscopic data used to identify this record-breaking quasar. Top: the photometric images, which show the detections at longer wavelengths, and clear lack of detection at the shortest wavelength (z-band). Middle: the spectrum of the quasar, including a zoom-in of the Magnesium II line, the width of which was used to determine the black hole mass. Bottom: the transmission of the 5 photometric filters used. Figure 1 in the paper. By looking at the spectrum of a quasar at such a high redshift, we can learn about its environment at this very early time in the universe. Hydrogen in the local universe is ionized: light can travel freely without being absorbed. But in the early universe, the hydrogen was neutral, absorbing all of the Lyman-alpha emission. The transition between these phases is referred to as the reionization of the universe. So at very high redshift, probing this epoch of reionization, there is still enough neutral hydrogen in the universe make a noticeable dent on the quasar spectrum. This great series of astrobites describes the effects of neutral hydrogen on the quasar spectrum in more detail, but in today’s paper the authors claim to detect a signature from neutral hydrogen which places this quasar well into the epoch of reionization – only observed once before, in ULAS J1120. This agrees well with estimates that the universe became ionized somewhere between redshifts 10 and 7 determined by other methods. The other major constraint that this observation provides regards the growth of supermassive black holes (SMBHs). The authors measure the mass of the black hole in this quasar to be around 800 million solar masses – which, only 690 million years after the Big Bang, means that somehow the universe had to grow a black hole that big in a relatively short amount of time. Using typical growth estimates for SMBHs, this requires a seed black hole with a mass of at least 1000 solar masses. Along with other high-z quasars, this puts significant constraints on models of SMBH formation. This discovery is much more than just a new record holder: it provides another probe into the early universe, allowing us to test theories of the evolution of the first billion years. But as the authors emphasize, more detections at high redshift are required to better understand the history of ionization of the universe – this discovery has doubled the sample size of quasars at z > 7, but two is still a very small sample! My model of a black hole uses the gravitational potential of a contracting sphere of matter to relatively freeze time and thus the contraction from the inside out. It is referred to as a black star. Using a program written in Excel it was found that a supernova remnant, with a mass between 1.44 and 2 solar masses, contracts down to a neutron star. Due to increased gravity, it continues to contract down to where the pressure, beginning at the center, supports the incoming mass where the contraction stops. During this contraction the decreasing gravitational potential cause time to slow, but it is not enough to cause time to freeze. For larger solar mass remnants, during the contraction, the increased gravitational potential is enough to causes time to relatively freeze starting at the center and stop the contraction before the pressure gets high enough to stop it, as it did in a neutron star. This also freezes the flow of information concerning the decrease in gravitational potential, thus; the frozen portions remain frozen and do not contract down any further. While this remnant is contracting down through a point where its’ radius is about 1.75 times the Schwarzschild radius, the gravitational potential meets the condition that causes time to first freeze at the center. By freeze I mean the rate of time flow becomes equal to the square root of a value that gets ever so close to zero; but, it never crosses over and becomes negative, where the rate of time flow would become imaginary. This means that at the position where time is getting close to being frozen, the coordinates do not reverse and become null light-like instead of time-like as it would on the inside of an event horizon or a radius that is frozen. The remaining shells of matter, which have not been frozen, continue to contract in and cause the gravitational potential to decrease which causes the next layer to freeze. Most of all the remaining unfrozen shells will continue to contract and freeze each successive layer almost all the way to the surface. The last bit of contracting matter near the surface will only have enough mass to cause time to significantly slow, but it will not quite freeze. If the freeze made its way to the surface, it would meet the condition of a black hole, having a Schwarzschild radius; but, it does not quite get there. What has been created is sometimes called a black star which has no event horizon or singularity and has frozen matter through-out its volume. Stars made of hydrogen and helium, contract down and typically ignite at a temperature of 1.6×10^7 ˚K and at density of 1.5×10^5kg/m^3. SMBSs between 50,000 and 3 million solar mass have a density above 1.5×10^5kg/m^3. If made of hydrogen, this would start the fusion and release excess heat which would reverse the contraction and growth of the SMBSs. Instead, these SMBSs need to be made from dust and gas left over from dying star explosions. This used star matter is ideal because it will not fuse and form hot matter that would hinder the formation of SMBSs. SMBSs larger than 4 million solar masses would not have this star ignition problem and could be made of pure hydrogen. As this huge ball of gas contracts down, the gravitational potential at the center gets low enough to cause time to freeze and stop the contraction at a density less than 1.5×10^5 kg/m^3, which is below the point where the fusion of hydrogen starts. This would allow for a direct collapse into black stars without the problem of star ignition. These SMBSs end up having a lower density with no singularity or event horizon. After their creation, an accretion disk and jets could push back the gasses into dense clumps starting the creation of the first stars in the galaxy. Note: Because of this same reason, stars above 4 million solar masses cannot be created because the time freeze would stop the contraction and prevent fusion. was recently published in the pier reviewed Journal of High Energy Physics, Gravitation and Cosmology, in which I discuss a computer model that poses an alternative process to the accepted theory of the formation of a black hole. Due to a unique requirement of creating black holes by freezing time and space from the inside out, the conventional method of deriving results from general relativity could not be used. Instead I used the Newtonian model, while factoring in relativistic corrections derived from general relativity which includes the relative contraction of both time and space and the equivalence principal. This mathematical model, using Excel and Visual Basic, takes about a day to run.